TEXAS A. AND M. AG-1. As part of an extensive research programme on agricultural aviation problems, sponsored by the National Flying Farmers Association in co-operation with the C.A.A., the Texas A. and M. College designed and built the AG-1 agricultural monoplane. At the time of its first flight - 1st December I950 - the AG-1 was the first aircraft designed wholly for crop-dusting or spraying. Designed by Mr. F. E. Weick, the AG-1 incorporated the characteristics most desired in dusting and spraying aircraft, information on which was obtained from operators by means of a nation-wide survey by the C.A.A. One innovation was the sharpened leading edges of the main undercarriage struts, enabling them to cut any wires or cables encountered in flight. In June 1953 the AG-1 was destroyed in a flying accident and a much-modified version, the AG-2, was developed for commercial production by the Transland Company, of Torrance, California. Third of the AG designs is the AG-3, an experimental aircraft designed to carry a spray or dust load of 800 lb . It is smaller in size and cheaper to make than the AG-1, as it makes use of a number of standard Piper Cub components. It is a low-wing. strutbraced monoplane. The prototype made its first flight in November 1954. Power is provided by a 135-h.p. Lycoming engine. 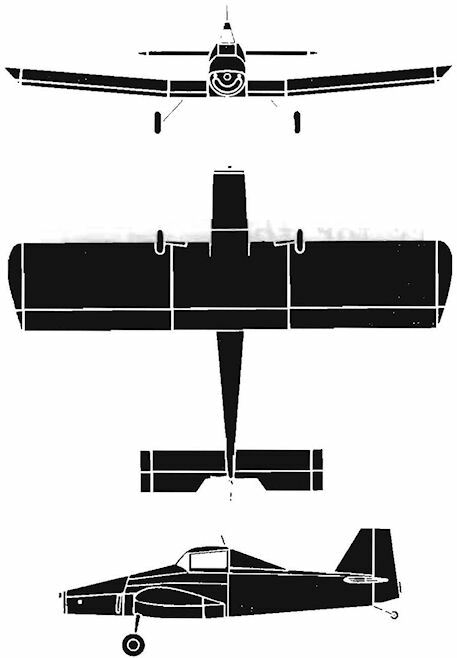 Salient features : A low-wing. constant-chord, cantilever monoplane of all-metal construction. the AG-1 was a functional, angular machine. Accommodation: Pilot, seated in an open cockpit which, owing to the 15-degree slope of the engine cowling, provides an excellent view ahead. Equipment : Hopper for dust, seed or fertiliser in fuselage ahead of cockpit, and two tanks, each with capacity of 150 U.S. gallons. for spray liquid in centre-section, one on each side of the fuselage.